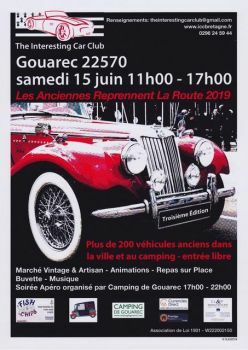 In June 2017, along with another French association, Les Historiques, we organised “Les Anciennes Reprennent la Route” vintage weekend in Gouarec, by the lovely Nantes-Brest Canal in central Brittany. The sun shone for the whole weekend and by Saturday afternoon temperatures were into the low thirties. From midweek, cars, caravans and campers started to arrive at the campsite in Gouarec (run by Geoff and Kate Husband). They came from all parts of France and the UK. Saturday was an amazing day, 130 old cars, bikes and even tractors lined up around the old streets of Gouarec which was closed off to normal traffic. Over 3000 people came to see the vehicles and look around the bustling vintage market underneath the old market place, which was selling clothes, jewellery and an array of vintage crafts. The bars and restaurants were overflowing with people taking lunch, or just stopping for a cold beer to savour the atmosphere. Hot English pies and pasties were being sold by Kerbian Farm from their shop too. The local school children were given a ride around Gouarec in the cars before delivering an enthusiastic rendition of 1960s dancing. The evening was full of dance, music and laughter down at the campsite and gave the organisers a chance to unwind with a beer or two! Sunday saw a relaxed drive out from L’Abbaye de Bon Repos to the lake at Langoelan and a picnic under the shade of the trees. June 30 and July 1, was just as lively, festive and happy. More than 200 cars expected and food, stands & entertainment.